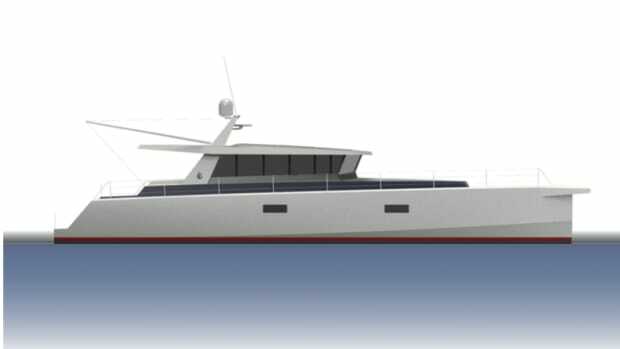 The Magellano 50 begins a line of economical long-range cruisers with serious environmental credentials. Boats designed to be all things to all people rarely satisfy anyone. The Magellano 50, a long range cruiser from Azimut, is that rare exception, starting with its innovative hull design. 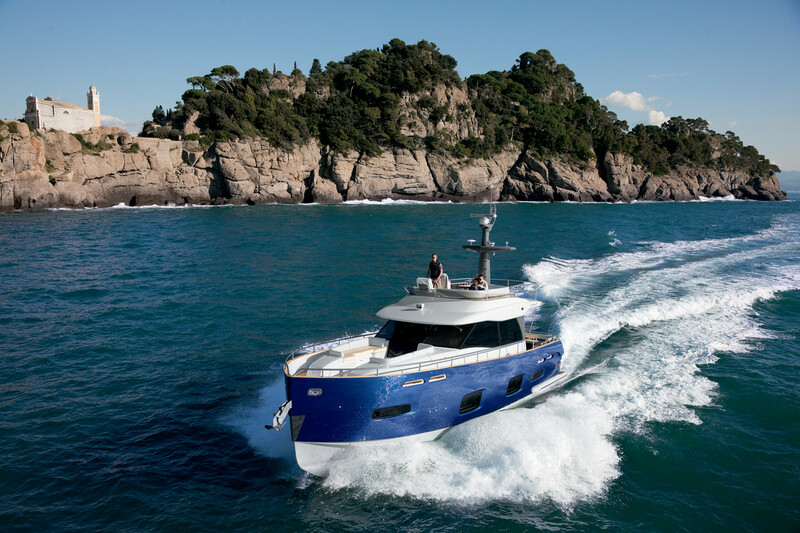 The 50, like all Magellanos (there are plans for several more models), has an innovative dual-mode hull which greatly decreases the amount of horsepower she requires to run efficiently and quickly. The Magellano is pushed along by high-efficiency propellers that are turned by twin, low-emission, 425hp Cummins QSB 5.9s. That horsepower may sound low to you for a boat of this size, but it is by design. The builder refers to the hull as dual-mode because the Magellano actually has two optimal cruise speeds. She functions ably as a full-displacement vessel at 6 to 7 knots but can also cruise in semi-displacement mode at around 16 knots. This is no magic trick. Hull designer Bill Dixon designed the Magellano’s bottom with a soft, rounded midsection that helps her smoothly transition from slow speeds to higher ones. The result is a boat that is as comfortable at trawler-like paces as she is getting up on plane and scooting around the ocean blue. 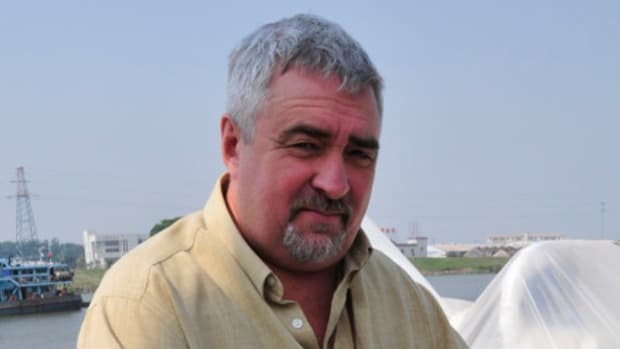 When I tested her off of Savona, Italy, not only did I take her hard over in three boat lengths at 16 knots, but on the pins, I got her up to 18.3 on an admittedly dirty bottom. If clean, I wouldn’t be surprised if she eked out another knot or two. What’s more, at either of her two cruise speeds, she positively sips her fuel. At 6 knots, she burns only 2.3gph, and at 18 knots, she uses only about 40. (Shortly after the test I calculated those numbers and actually said out loud at my desk, “Wait, can that be?” even though I was by myself. Don’t judge—I spend a lot of time on my own. Regardless, those fuel-burn stats are legit.) What’s more, Azimut even has the ability to outfit this boat with the revolutionary Easy Hybrid System, which allows her to hit 7 knots with electric power. I’m told it’s not on the regular options list because the setup really takes some doing, but it is possible. The Azimut factory in Avigliana, Italy is surrounded by a particularly lush patch of the Italian Alps. Thick armies of leafy green trees rush down the rugged peaks, around ice-blue mountain lakes, and into the populated valleys below. Despite man’s industrial encroachment, the place retains a feeling of magic, as if it were a slice of terrain dreamed up by Tolkien—a place where impossible might not be so cut and dried. Above it all, silhouetted against the heavens at the apex of a mountain vista, sits the church of Sacra di San Michele, holding saintly vigil over all of these natural gifts. If one were feeling poetic, he might make the connection that Azimut itself has taken some symbolic cues from San Michele as to how to protect environments like this the world over. Its latest long-range cruiser, the Magellano 50, spares little expense when it comes to being as environmentally friendly as a powerboat can be. 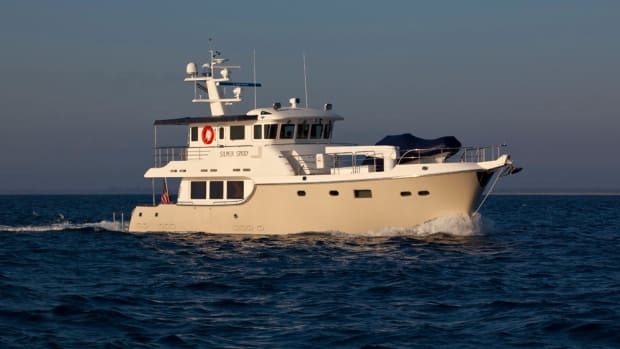 The 50, which launched in late 2010, is the second build in the Magellano line following 2009’s much-lauded 74-foot model. Many of her features were added specifically to make her as unobtrusive to the natural environment as possible. For example, any teak onboard is “new” teak, which means that it is harvested from trees registered with the Forest Stewardship Council. Also, the new teak is made from glued strips of wood, which not only makes it stronger than traditional teak, but allows craftsmen to use up to 90 percent of the tree, whereas traditional teak usually uses only about 20 percent. So it’s clear that Azimut certainly had the environment in mind when it designed this boat, which is all well and good. But it doesn’t mean much more than squat if the Magellano 50 isn’t a boat that you would want to own for her nautical merit. Fortunately for team Azimut, they’ve managed to put together a dandy. 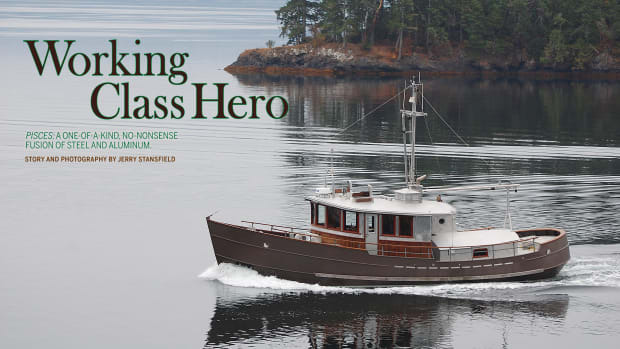 Aesthetically, the boat is quite pleasing, marked by a look I’d call “modern salt.” She was designed to act as a long-range, but sporty, cruiser, and that’s exactly what she looks like. Her lines are paradoxically traditional and yet also distinctly contemporary, and are perhaps most strikingly marked by her near-vertical bow. This trait not only makes her stand out at the docks, it also keeps her LOA/LWL ratio very close, which aids with her fuel efficiency at displacement speeds. Furthermore, the navy-blue hull paint on my test boat bordered on beautiful. It’s the color I would recommend to any buyer. And her onboard features don’t disappoint. Those relatively diminutive Cummins diesels I mentioned earlier serve a twofold purpose. They not only keep her green, but they also leave a lot of space in the engine room for easy maintenance and repairs. 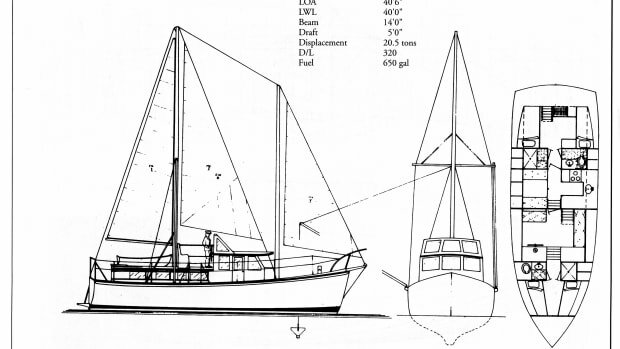 There was even enough space on my test boat to hold a Seakeeper gyro stabilizer aft, a feature that, coupled with a not-inconsequential keel (draft is 4 feet, 4 inches), rendered the boat exceptionally stable. The saloon comprises the main indoor entertainment area. It features excellent natural light and views since it’s almost completely surrounded by large windows—a feature that guests will surely appreciate in the more exotic locales the Magellano was designed to visit. The space also features innovative stowage areas littered throughout the interior that are ideal for more ambitious cruises. An aft galley makes al fresco dining de rigeur. And if the big game happens to coincide with a gorgeous day out on the water, have no fear, a 32-inch TV in the after part of the saloon cranes out on a pivot, so it is viewable from the cockpit. Problem solved. Down below, the Magellano comes with either two or three staterooms. Of note is that the amidships master with its athwartships berth, and the forepeak VIP are very similar in size, which should keep cruising couples happy. The main difference is that the master has an en-suite head, while the VIP only has private access to a head that it shares with the rest of the deck. Topside, as you might expect from an Italian boat, the Magellano is built for people who enjoy spending time in the sun. The flybridge is ready to party with a dining settee to port, a barbecue, and a sink. However the coolest feature on this deck is indubitably an outdoor shower hidden in the radar arch. If you ever happen to have a Hollywood starlet, or perhaps a royal-family black sheep onboard, tell her to go try out that shower—it’s a good way to get pictures of your boat on TMZ. But if you’d like a bit more privacy, just move the party forward to the bow, where there’s another entertainment area featuring two bench seats. This feature, which is somewhat of a rarity on 50-footers, is particularly useful anywhere boats dock stern-to, so that passengers can glean some respite from prying, onshore eyes. However, it is still an ideal place to chill out no matter where you decide to cruise, and with this boat’s leggy, near-2,000-mile range at displacement speeds, those destinations will be myriad—which is kind of the point. Azimut went through all this trouble to build a boat that’s kind to our planet, so you can hop onboard, get out there, and go explore it. HOLDING TANK: 792 U.S. gal. Test conditions: Air temperature: 61 degrees Fahrenheit; Humidity: 30%; Seas: flat; Load: 650 gal. fuel, 165 gal. water, 6 persons, 220 lb. gear. Speeds are two-way averages measured w/ Raymarine display. GPH was taken via Raymarine display. Range is 90% of the advertised fuel capacity. Decibels measured at helm in dBA. 65 dBA is the level of normal conversation. This is a Web Extra for the July/August 2013 article "Italian & Post-Modern: Magellano 43."